My first try at canning was a success! 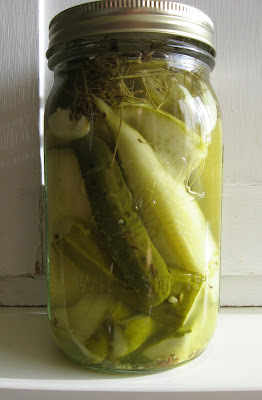 I now have 10 quarts of picture perfect dill pickles! I'd like to do more but finding the time before cucumber season is over may be a challenge. We had a late harvest for most of the produce this year so I may just get lucky. I also attempted to finish my market bag but the handles are giving me issues. After completing the handles I realized the opening was way too small to appropriately carry anything bigger than a grapefruit. So I'm in the process of frogging the handles and trying to knit them on larger needles. Here's a picture of it with one of the insufficient handles still intact. Your know how to can? Plese come teach me. Those pickles are making my mouth water.